Filips Koninck (1619-1688), born in Amsterdam, studied with Rembrandt and devoted himself most to landscape, only a few portraits by him being known. He received from his master that prepossession for distance and perspective which is so noticeable in Rembrandt's "Three Trees." 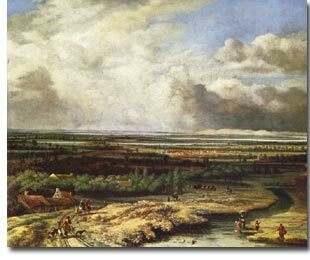 His expansive views, embracing great tracts of country, as seen from a height, with the sand-dunes in the far distance lighted by gleams of sunshine against gray rolling clouds, are distinguished by much grandeur of conception and by richness and truth of colouring. His pictures are rare in the great continental collections.